So here I am now in HK and loving every minute of it! Sure, life is tough in a city which never sleeps and I’ve got all these ambitions to meet new people and live every moment to it’s fullest. I think I’ve been pretty successful so far. 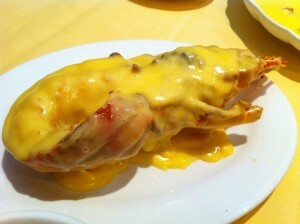 Last night a friend took me to this really cool seafood restaurant which served cheese-baked lobster! Wow, amazing. It seriously melts in your mouth when it comes straight out the oven, cheese oozing down the side. Then we went to causeway bay for dessert and drinks. Dessert was a bit of a disaster since we were still stuffed from salted-egg aubergines and silky steamed egg and tofu. But drinks was at this rather shady looking building. On the front entrance there is a large sign which reads “Members Only” and I stand in front of it thinking, wait a minute… how is she going to get in?! She’s not a member. But we still end up drinking the night away and enjoying Mr. Ichiro’s over-dramatised cocktail making stunts. A mix between pure focus and slight constipation. But end result? Great cocktails. Yet another brilliant night out in Hong Kong.